wine profile Another warm vintage means nice ripe blackberry fruit flavours and classic black pepper spice from Syrah. While the Viognier adds a slightly softer floral edge, this vineyard site also brings a nice herbal earthiness to the wine, perhaps due to the old growth sage that surrounds it. By combining the strong masculinity of Syrah with the more delicate femininity of Viognier, the result is a classic example of how the whole is greater than the sum of its parts. winemaking notes 50% of this wine is not just aged, but also fermented in French oak puncheons and tanks, which imparts silky tannins and a lush roundness to the Syrah. The grapes was fermented in three separate lots: 1 lot co-fermented with Viognier in stainless steel fermenters, another lot was fermented in 500 L open top puncheons, and the last lot was fermented in a 2600 L oak tank called “The Ferminator”. In this large wooden tank, 20% was left as whole cluster and 80% whole berries. After pressing, the wine was barrel aged for 14 months in 40% new French oak. vintage notes In 2013, we were again blessed by Mother Nature with a warm growing season. However, every year always brings its challenges and while we had solid heat units through the summer months, it also brought some humidity which is not usual for the Okanagan. For reds, mildew pressure was higher than normal, but with prudent farming strategies, our vineyards were not affected. It can be tempting in a good growing year to leave extra crop on the vines, but our approach is to be conservative and crop the vineyard lightly to deal with the unpredictability of weather. Fortunately, after some rains in September, the weather dried up through October which allowed us to pick on schedule at optimal ripeness levels. 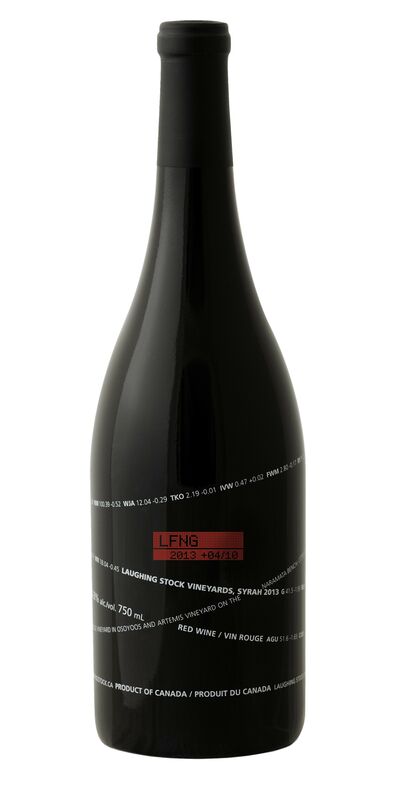 "Laughing Stock has consistently been among the leaders in BC's rush to syrah as a signature varietal. My compass was set long ago by the great northern Rhone, and this dials it in well - I with a bit more ruggedness and extraction. It pours deep black. Very lifted on the nose with dill, capers, licorice, smoke, black fruit and a touch of violet elegance that puts it over the top. It's still tannic, it's dense, it's delicious. Excellent length. Tasted June 2014"
"Intense floral violet, blackberry and blueberry fruit with some interesting baking spice and paprika and a touch of dried herbs. The palate has a lovely elegance and freshness while still showing powerful black fruit. The tannins are ripe and firm giving structure along with the dusty, peppery, blueberry and blackberry flavours, all with a long finish. A classy and elegant BC Syrah. (Tasted July 2015)"